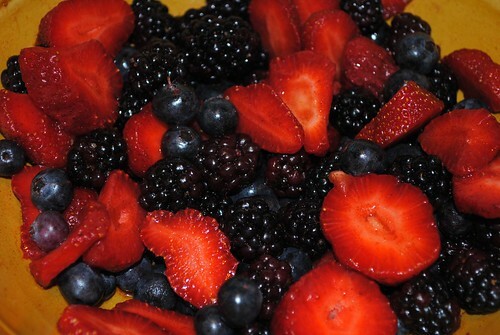 A sure sign that summer has arrived is the beauty of fresh fruit and berries in the market or grocery store. Road-side farm stand produce is a palette of bold colors that make me salivate. With truly excellent ingredients, less is more. When I was pregnant, I craved a light refreshing drink with just a touch of tang and a hint of sweet – but with no alcohol or caffeine. Enter, the Faux-jito and its partner dessert, Mojito-inspired Fruit Salad. 1. Blend the lime juice and sugar/honey in the bottom of the drinking glass. Add the mint and crush ingredients together with the back of a spoon or muddler. 2. Spoon the ice on top of the mint then top with the sparkling water. 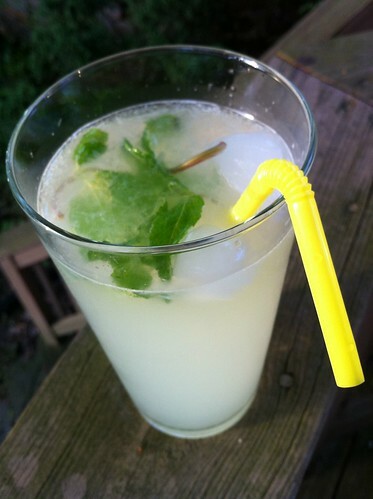 Serving Suggestion: A slice of lime on the rim of the glass and a sprig of mint tucked beside it in the ice. 1. Blend the lime juice, sugar/honey, and mint. Set aside. 2. In a large bowl, gently toss the fruits together while splashing the salad with the dressing. Add the berries (or kiwi) to the top so they do not get mushy. 3. Chill the salad until it is time to dine. Serving Suggestion: Serve with butter cookies or shortbread to be dessert or alongside scones or waffles and whipped cream as a brunch dish. Note: The best part of this recipe is that you can use whatever fruit is in-season or available in your region. This photo shows when it was made was just fresh berries. That time, we enjoyed it with vanilla bean ice cream. This entry was posted in Dessert, Drinks and tagged dessert, drink, fruit, mocktail, non-alcoholic, Salad, summer.